CAPE CANAVERAL, Fla. — Even in space, a little duct tape may work wonders. Astronaut Piers Sellers suggested using some of the multipurpose sticky material to fix a safety-jet backpack used during spacewalks after it almost came loose from him while he repaired the international space station. "Right now, is there some kind of tape fix that you guys could think about that would be helpful?" Sellers asked Mission Control Tuesday morning, a day after the propulsive backpack started to come loose during his spacewalk with astronaut Mike Fossum. Fossum had to tether the device to Sellers to keep it from flying away. 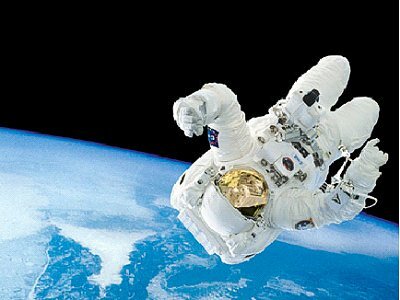 The jet backpack, nicknamed SAFER, is worn by every astronaut during a spacewalk. It allows an astronaut to propel himself or herself to safety in an emergency, for instance if a tether or foot restraint holding the astronaut in place breaks. The two connecting devices of Sellers' backpack attachment, designed to be used if an astronaut floats free, loosened at different times, but he was never in danger of losing it, NASA officials said. Sellers and Fossum were to make three spacewalks during space shuttle Discovery's 13-day mission to the space station, which ends next Monday. During the second spacewalk on Monday, the spacewalkers replaced a cable reel to a rail car needed to move large pieces around the space station and installed a pump compartment for the complex's cooling system. "That was a great [spacewalk] and it showed that Aggies can be taught to work locks, latches and anything else," flight controllers wrote in their daily morning electronic message to Discovery's crew, referring to Fossum, a graduate of Texas A&M. "Miracles never cease." Discovery pilot Mark Kelly, who helped choreograph the spacewalk from inside the space station, told Houston he thinks the latches on Sellers' backpack came undone inside the shuttle's crowded payload bay. "It's surprising that it did happen, but he's bumping a lot around in there," Kelly said Tuesday. For Wednesday's spacewalk, the astronauts planned to test whether a sealant can be used to repair damaged pieces of the space shuttle's thermal protection system. The technique was developed to make sure there's never a repeat of the Columbia accident that killed seven astronauts in 2003. The six astronauts of Discovery, along with the three space station crew members, planned to spend most of Tuesday packing up science experiments, trash and unneeded equipment to take back to Earth. They awoke to a recording of Smash Mouth's "All Star" chosen by the family of astronaut Lisa Nowak. Flight controllers in their electronic message praised the crew for transferring cargo so quickly. "Transfer is going so well, we thought about giving you a bunch of time off," they said, "but then after the laughter died down, we actually did decide to reduce transfer a few hours today."